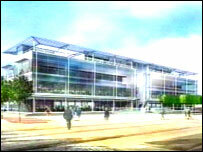 Work on a prestigious four-storey office building near Hull's marina has started, despite the wintry weather. Developers of Island Wharf have said they hope the building will be the first of several overlooking the river Humber and attract jobs to the area. Although the occupiers have yet to be confirmed, Citybuild which is behind the scheme, is waiting to hear if Northern Foods will move in. The steel frame of the building is now taking shape. Island Wharf is part of a master plan to join the city centre to the waterfront. John Haymes from Hull's urban regeneration company, Citybuild, has said the public areas at Island wharf will offer "unparalleled views" with seating , landscaping and walkways. Site preparations and flood defence works took place last May and the office building is due to be completed in the autumn.